Dental amalgam has been the filing material for choice for more than 150 years. However, because of their aesthetics and concern over their mercury content their use has been declining. The Minamata Convention on Mercury has also proposed that their use be phased down according to local needs. The development of tooth-coloured resin composites from their initial use in anterior teeth to amalgam substitutes in stress-bearing posterior restorations provides a clear alternative. However, there are concerns as to whether their longevity is comparable to amalgam. The aim of this review was to assess the long-term survival of posterior resin composite restorations using individual patient data from long-term follow-up studies of at least 5 years duration. Searches were conducted on the Cochrane Library, PubMed, the Web of Science (ISI), and Scopus for English language studies. Longitudinal studies of direct class II or classes I and II restorations in permanent dentition of at least 5 years duration, a minimum of 20 restorations at final recall and the original datasets available were considered. Study selections and appraisal was carried out independently by two reviewers. 12 studies were included involving 2,816 restorations (2,585 Class II and 231 Class I restorations). 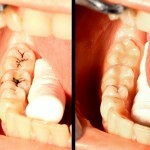 The main reasons for failure were caries and fracture. The regression analyses showed a significantly higher risk of failure for restorations in high-caries-risk individuals and those with a higher number of restored surfaces. The overall annual failure rate at 5 years and 10 years was 1.8% and 2.4% respectively. In high caries rate individuals the rates at 5 and 10 years were 3.2% and 4.6% respectively. The conclusion of the present meta-analysis of 12 clinical studies based on raw data is that caries risk and number of restored surfaces play a significant role in restoration survival, and that, on average, posterior resin composite restorations show a good survival, with annual failure rates of 1.8% at 5 years and 2.4% after 10 years of service. Opdam NJ, van de Sande FH, Bronkhorst E, Cenci MS, Bottenberg P, Pallesen U, Gaengler P, Lindberg A, Huysmans MC, van Dijken JW. Longevity of Posterior Composite Restorations: A Systematic Review and Meta-analysis. J Dent Res. 2014 Jul 21. pii: 0022034514544217. [Epub ahead of print] PubMed PMID: 25048250. Rasines Alcaraz MG, Veitz-Keenan A, Sahrmann P, Schmidlin PR, Davis D, Iheozor-Ejiofor Z. Direct composite resin fillings versus amalgam fillings for permanent or adult posterior teeth. Cochrane Database of Systematic Reviews 2014, Issue 3. Art. No. : CD005620. DOI: 10.1002/14651858.CD005620.pub2. @TheDentalElf Makes sense when you see some of the lumps attached to teeth as ‘restorations’!